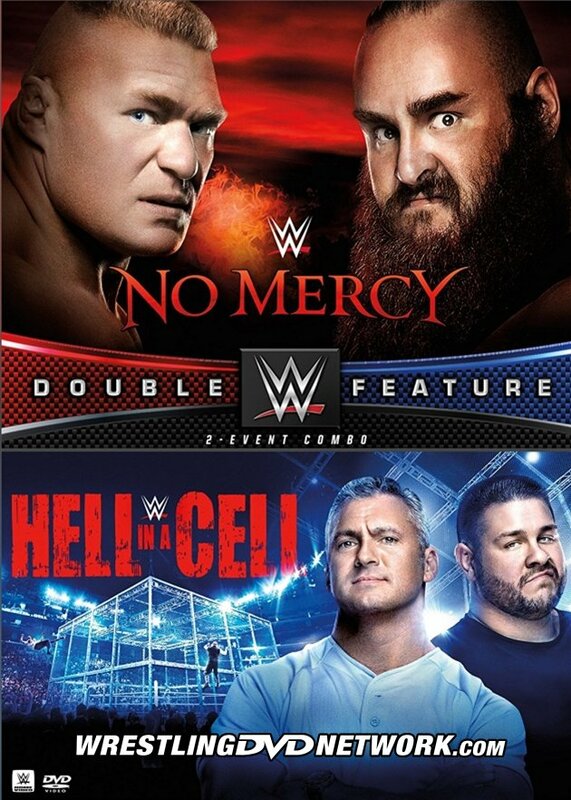 WWE has today finalized the cover artwork for their next “Double Feature” DVD that will combine last month’s No Mercy 2017 PPV with this past Sunday’s Hell in a Cell 2017 PPV. “Double Feature: No Mercy & Hell in a Cell 2017” DVD will be stacked with all of the memorable matches and moments from those cards, including: Brock Lesnar vs. Braun Strowman, John Cena vs. Roman Reigns, Kevin Owens vs. Shane McMahon, along with the two classic tag team battles in Dean Ambrose & Seth Rollins vs. Sheamus & Cesaro, and The New Day vs. The Usos! The 2-disc DVD set is scheduled for release to the United States in November (get a copy for $14.99 here on Amazon.com), to the United Kingdom also in November (£14.99 here on Amazon.co.uk), and finally to Australia in December. Let’s take a look at the front cover, back cover and extras you can expect to see on there. “The Beast Incarnate” Brock Lesnar and “The Monster Among Men” Braun Strowman tear each other apart in Los Angeles for the Universal Championship. In a WrestleMania-worthy dream match, The Cenation does battle against The Roman Empire as John Cena faces off with Roman Reigns for the first time ever. Alexa Bliss defends the RAW Women’s Championship against Bayley, Sasha Banks, Emma, and Nia Jax in a Fatal 5-Way Match. Plus More! The Superstars of RAW show no remorse, no retreat, and NO MERCY! Surrounded by pain, suffering, and unforgiving steel, the conflict between SmackDown Live Commissioner Shane McMahon and Kevin Owens comes to a head when they try to tear each other apart inside the Hell in a Cell! “The King of Strong Style” Shinsuke Nakamura gets his opportunity at revenge when he faces Jinder Mahal for the WWE Championship. The SmackDown Tag Team Championships will also be defended inside the demonic structure as The New Day defends their titles against The Usos. And Natalya hopes to retain her SmackDown Women’s Championship against Charlotte Flair. On this night, the Superstars of SmackDown Live get taken to Hell! – USA: November 14th. Grab the next “WWE Double Feature” DVD now here on Amazon.com. – UK/Europe: November 27th. Get the next “WWE Double Feature” DVD here on Amazon.co.uk. – Australia: December 13th. Grab the next “WWE Double Feature” DVD at Madman.com.au. The short answer is yes. The long answer involves the Network, changing technology, physical media dying and a lot more reasons. I wish we got those large box sets here in the States that just have all PPVs for the year. I think Australia or somewhere gets them. I’d grab those for sure. I love the anthology idea. It’s not the “short answer” at all. CJ Styles’ answer is more accurate. Except it’s not more accurate. Like I mentioned in another post on this thread, they haven’t doubled their ppvs since last year. They’re doing 16 ppvs in 2017, not 24. They had no problem releasing all 16 ppvs individually in 2006. PPV dvds are doing bad, as are most of their home video sales in general. They’re cost-cutting like crazy. Look at their quarterly reports and you’ll see that year-over-year their home video department drops every year. Especially since the launch of the Network which has hurt their home video sales drastically. They’ve been doing it for months. This isn’t new. No Gable & Benjamin vs Hype Bros pre-show match for Hell In A Cell included. Not surprising since the PPV itself ran 3 hours & 33 minutes. Well, thats what a 20 year old dated format will do for you….once ppvs run over 3 hours quality will suffer and no extras. Money in the Bank 2016 was around the same and had no extras and there were major pixelation issue due to compression. Yup. That happens with shows over 3 hours on one disc. The worst example of that was WrestleMania 2000. That DVD release was atrocious. It was like they recorded it in EP mode. The pixelation was inexcusable. I really stopped collecting the PPV releases several years ago and then started once again in 2017 due to this new packaging and WWE basically dropping the price. Just curious if anyone knew why WWE went this route? Was it a money saver for them? I wish they had done this years ago. Unfortunately, this seems temporary just like everything else they do. Not sure why. Maybe just an easier way to release the PPVs. And they will probably do it again next year. Probably because ppv matches don’t live up to fan expectations nowadays since most of them contain flippity flop matches and NO holds, ring psychology, story telling, the important things that make a wrestling match great. PPV DVD’s have probably done low sales in years or most just watch it on the Network so wwe are doing a double pack format to get younger fans to buy them is my guess. Haven’t doubled. They’re doing 16 ppv’s in 2017. They also did 16 ppv’s in 2006 and released all of them individually. It’s more about saving money. They cut back a lot on their home video department. 16 is completely overkill. Way too many. Someone said here the other day they missed when it was 4 per year and I can completely agree. With only four events per year, build ups would be huge and each match would absolutely be worth watching. When I miss events now, I know I can end up with basically the same thing a few weeks later. 16 is definitely overkill. I agree with that. But they’ll never go back to 4 ppv’s a year. If they were still only on traditional ppv, I would say go for it, but with the Network, they need to have at least 1 ppv a month or else they’ll only have people subscribing 4 months out of the year. The ppv’s are the big draw for the Network. As great as the back catalog is, the numbers show that the live ppv’s are what brings in the majority of subscribers. I agree that times have changed. Its a marketing thing and a money making device for sure. I think one a month, excluding NXT, should be the norm. The brand split makes it difficult too as you get a smaller roster to work with each time.